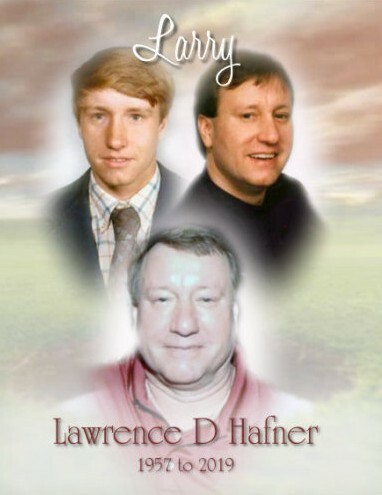 Lawrence D Hafner, 61, of Toledo, OH, passed away peacefully March 30th, 2019, surrounded by his loving daughters Chelsi and Jordan and family after a courageous battle with cancer at The Toledo Hospital. Larry was born the fourth child of thirteen siblings to Leonard and Mary (Beno) Hafner. Growing up in a large family, sports were always a favorite past time of Larry's. His competitive, hardnosed drive and natural athleticism made him an accomplished athlete. He played football for Central Catholic High School, earning an honorable mention in the All-City League his senior year. Larry was an avid golfer with a 4 handicap in his weekly golf league. He also played softball and basketball, Larry left it all on the field. His passionate and competitive nature followed him into the business world. After high school, Larry started what would become a 42-year career with Sofo Foods. Driving trucks, servicing many restaurants throughout N.W. Ohio and S.E. Michigan. Larry continued to grow with the company as they expanded and moved to their current location. He became Senior Category Specialist for the Ohio, Kentucky, Houston and Atlanta markets, earning him the nickname “The Legend”. Larry had an infectious smile, humorous wit, and a twinkle in his eye that lent him the ability to make friends easily, building lifelong relationships. Quoting daughter Chelsi, " Dad made everyone he met and everyone who knew him a better person." Jordan said he was “The toughest teddy bear”. Early in his Sofo career, Larry would often “enlist” the company of one of his brothers for help with the delivery stops along that day’s route. Using his arsenal of charm, guilt or any other means, saying no was not an option. Bonding with your brother, great pizza and a 6-pack afterwards were their rewards. Family was everything to Larry. The endless love he had for his daughters, Chelsi and Jordan, was ever apparent. He supported them any way he could during his life. Larry was proud to be a coach, cheerleader and Dad to his girls. Also, to his brothers and sisters giving them support, guidance, and tough love as they journeyed together through life's many challenges and celebrations. None were more important than his precious grandchildren Calan and Cami. Saturday was Papa and Calan’s special day together, chores, paying bills, grocery runs and yard work, affectionally known as “taking care of business”. Larry was preceded in death by his parents and brother Charlie. He is survived by his daughters Chelsi (Vince Tucker) and Jordan (Tyler Smith); Grandchildren Calan and Cami; Brothers Daniel (Beth), James, William (Karen), Theodore (Pam), Thomas, Joseph (Sue), John (Michelle), Raymond (Patti) and Carl (Jody) Hafner; Loving sisters Theresa (Brian) Burgin and Mary (Mike) Pederi; many nieces, nephews and cousins; and former wife and friend Traci Mazur. The family would like to thank all his friends, neighbors, co-workers and extended family whose love, prayers and unending support strengthened him through his final months, weeks and days. Friends may call at the Reeb Funeral Home, 5712 N. Main St. Sylvania, OH, Friday April 5th from 1-9 P.M. The Funeral Mass will be conducted at the St. Joseph Catholic Church, Sylvania, Saturday the 6th at 10 AM, where family and friends may gather one-hour prior. Larry will be laid to rest at Calvary Cemetery.